BlogCamp.in is being touted as “India’s Biggest & The Most Comprehensive blog event ever conducted”. Yahoo India has confirmed it’s Platinum Sponsorship.To be held on 9th and 10th September 2006 at Tidel Park, Chennai, India with an impressive lineup of speakers this would be a worth attending event.Press coverage & Video by CNN-IBN here. 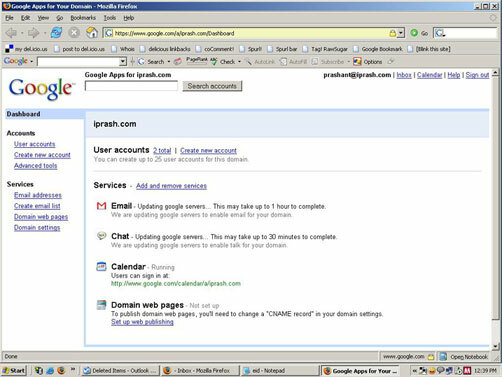 Latest offering from Google here >> http://www.google.com/a called as “Google Apps for Your Domain” was released today. This is a boon for small businesses, blogs, personal websites & other non-citical mail applications. Google will host your email account for free [as of today]. 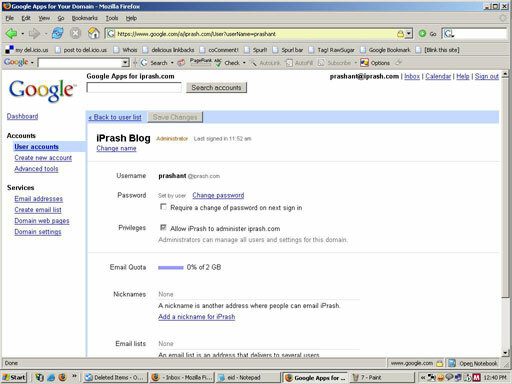 This is not only for Gmail, but also Google Talk, Google Calendar & Google Page Creator. So, essentially, you get all the functionalities of the above hosted for you for free ‘On your own Domain Name / Website’. For Google this is 1) Yet another way to increase their Adwords inventory, 2) Make their mail service more popular, ie get more users to Gmail 3) Get user for their other products which should follow here… like say.. Writely , Spreadsheets & more. Colleges & Univs can also avail this students, something like everyone.net from yesteryears. But, bottomline is that this is a good service for small business owners & personal blogs. 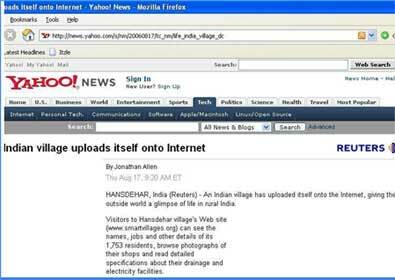 Just came across this article in Yahoo News > >here > http://news.yahoo.com/s/nm/20060817/tc_nm/life_india_village_dc which says >> “Indian village uploads itself onto Internet”. Now, since this news post is in Yahoo News, it would get lottsa coverage for sure, however, I am very anxious to find out, say 6 months from now, or a year later, as to how much has this really benefited the people of Hansdehar. Lets hope for the best.